“For over 20 years, James Harrigan and Domenic Cappello (Harri & Dom) have taken to a small DJ booth in the basement of Sub Club. Both massively influential DJ’s, producers, and label owners in their own right. After forging a friendship with 20:20 label head Ralph Lawson back in 92, Domenic and Ralph released 2 EPs on his label alongside Carl A Finlow in 95 & 96 titled Sheltered and Shielded respectively. 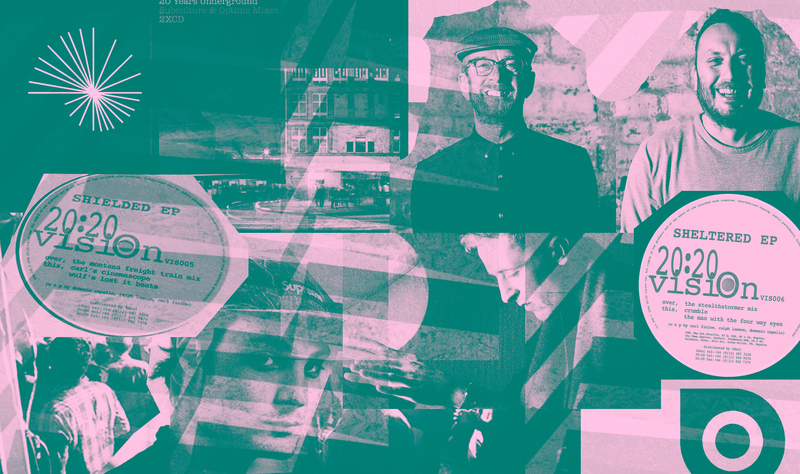 Since then, 20:20 vision have gone on to have loads of releases from artists like Fatboy Slim, Stephan Bodzin, Paul Woolford, Mark Broom and Motor City Drum Ensemble to name a few. Motor City Drum Ensemble (MCDE) AKA Danilo Plessow who recently played Fly Club Open Air Festival down the road in Edinburgh, is no stranger to Sub Club, having played back in 09 and 2015. An ensemble of just 1 man packs a real punch, with a very eclectic taste in music and technical knowhow shining through. More recently, Danilo teamed up with Marcus Worgull to create their collaborative project Vermont, released on Kompakt back in 2014. Worgull, an Innervisions big-gun back in 08 remixed “Woolfy vs. Projections ‎– Absynth” which was released on Permanent Vacation. A club favourite doing the rounds just now is a Permanent Vacation release by Tuff City Kids (aka Gerd Janson and Phillip Lauer) entitled “Labyrinth”. TCK always capture the spirit of whatever influences their music and this is apparent in their track “Trouwrig” taken from the Trouw Tribute LP, which released back in 2014 is dedicated to the music the late nightclub used to play. The now defunct club (RIP) produced a resident DJ, Job Jobse who also featured on the Trouw Tribute LP along with David Hasert and Barnt with their Cologne Megamix. Barnt who played at our RA residence party last week has a multitude of face melting tunes and remixes, including his remix of C.P.I – Proceso which was released on John Talabot’s Hivern Discs. Red axes released their 3 track EP “Pil Sagol” on the same label back in 2015 which features a stand out track from that year, “Todum Todum” which funnily enough, reminds me of a very Barnt-esque production. Red axes featured on Matt Walsh’s Clouded Vision Experiment CD, as did Daniel Avery & The Deadstock 33’s. Daniel Avery & The Deadstock 33’s song “Magnetic” was released on Optimo’s label, Barnt also remixed “Magnetic” (we always seem to be coming back to Barnt, the guys everywhere). Jasper James “Sneaky” EP was also released on Optimo, featuring a remix by Hillhead Young Team, which is Esa Williams (Auntie Flo) and James (Harri) Harrigan, who also happens to be Jaspers dad. Jasper’s other release “ZTRK1” released on Leftroom features a remix by JD Twitch of Optimo who released his first EP. Optimo (Keith & Jonnie) along with Harri & Dom are resident DJ’s at Sub Club. Back in 2007 both Harri, Dom & Optimo released a 2 part CD entitled Sub Club: 20 Years Underground to celebrate the club’s 20th birthday. This was released on Slam’s Soma Records. Also featured on that label under his alias “Hutton Drive”, Domenic Cappello released his “Escapades From The Edge Of The World” EP Back in 1997. Along with Harri & Dom, Ross Telford (or just Telford) is a resident DJ at Sub Club and A&R for Sub Club’s record label Nautilus Rising. With 2 releases under their belt Nautilus have had massive support, most notably from Dixon who had been playing Lord of the Isles – XIT for about a year before it was released and Dixon & Ame featured their 2nd release “Lazaros – Ge” in their Essential Mix for BBC Radio 1. Ame & Dixon collaborated with Henrik Schwarz on “Where We At (Version 3)”, Henrick Schwarz remixed Stevie Wonder “’Feeling You”, Stevie Wonder co-wrote Janet Jackson “New Agenda”, Todd Terry remixed Janet Jackson’s “If” and Todd Terry featured on Denis Sulta’s Fact Mix with “Keep On Jumpin” (JEEEZ THAT WAS A LONG ONE).